Click & Grow Review – Could growing plants really be this simple? Does Click & Grow Really Work? While we may not be able to grow all of our favorite veggies all year round indoors, there is no reason why we can’t grow those beneficial herbs and other smaller veggie plants, with no muss and no fuss according to what Click & Grow has to offer. 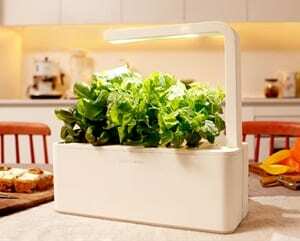 Click & Grow is a plant growing system that virtually is supposed to look after itself. You don’t have to worry about a watering and feeding schedule because the Click & Grow system looks after all that for you. The company claims that their Click & Grow system was inspired by Nasa, and this plant growing systems provides all of the necessary components for producing healthy and vigorous plant growth. They say its like giving the plants a Harvard schooling and its very own personal trainer. They indicate that plants absolutely thrive when being grown in the smart pots. Not everyone has a green thumb. Some of tend to kill our plants with kindness, thinking that they don’t have enough water, or they are starving for food. As a result we over compensate to the point where they are killed off with too many nutrients or drown in the abundance of water. The technology used in the Click & Grow takes care of all of that so there is no danger to the plants because of our over zealous care. There are several different versions and sizes of the product and probably one to get you going would be one of the starter kits. These vary in prices. For example, the Smart Pot for Strawberries costs $129.95 whereas the starter kit for the mini tomatoes is $79.95. Okay, so you are not going to have to commit to a rigid daily routine of plant care because the smart pot system is going to look after that for you, but you still have a little bit of responsibility. You are going to have to provide the water source that the system will need to use, but even that has been made super simple as the software that comes with the unit will remind you when the reservoir for the water needs to be topped up. For those that are really adamant about being able to grow strong healthy plants whether it be for a year round source of veggies, or for herbs, or even for simple plant beauty then the Click and Grow really does seem to be the ideal solution.It is a little pricey, but if you look back and add up all of the plants you have tried to grow in the past and failed with, plus buying all of the growing accessories then the Click & Grow just might be the way to go. We’re going to give this product a thumbs up rating. It really is based on smart technology,which is simple to understand and implement. It isn’t a big investment if you just want to start off with one starter kit.It could end up though that you are so impressed with your first attempt that you will soon be purchasing several more. There is nothing wrong with that if you are getting the desired results that you were hoping for. We’re going to suggest that you start off slow and make you first purchase form the selection of starter kits that the company offers. Choose one that you think is going to produce your favorite item. Read the directions that come with the unit carefully, and be sure to follow them. Don’t buy any more units until you have seen the results from the first purchase. If you are looking for other indoor quick and easy growing alternative then you may to check out the Grow Up Garden. What do you think? Does Click & Grow work or not? Does Bottle Top Really Work? Does Sonic Producer Really Work? Does My Lavender Garden Really Work?